Neil Munro (1863-1930) is well known for his brilliant humorous sketches which celebrate "Para Handy", the wily skipper of the puffer Vital Spark, and his crew. One of the most outstanding journalists of his day, he was also the author of fine historical novels of which "John Splendid" and "The New Road" are most highly acclaimed. Throughout his literary career he also wrote poetry. Not surprisingly, as a young Highlander compelled to move to the city of Glasgow for work, one of the main themes in this genre is exile. With the onset of the Great War in 1914, however, he found his true poetic voice. The devastating loss of his son in France and three visits to the front line as war correspondent galvanised him to write a sequence of sixteen well-crafted poems which he called Bagpipe Ballads. Many of these bring home to us the grim sadness of war and ensure Munro's place with the other notable Scottish war poets of the period. 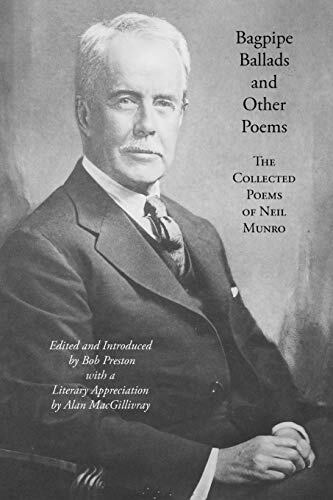 Bob Preston is to be congratulated for bringing together for the first time all of Neil Munro's known verses, for assembling them in chronological order of publication and for providing extensive notes which include the publishing history of each poem. Neil Munro (1863-1930) was a Scottish journalist, newspaper editor, author and literary critic - now mainly known for his creation of Para Handy.